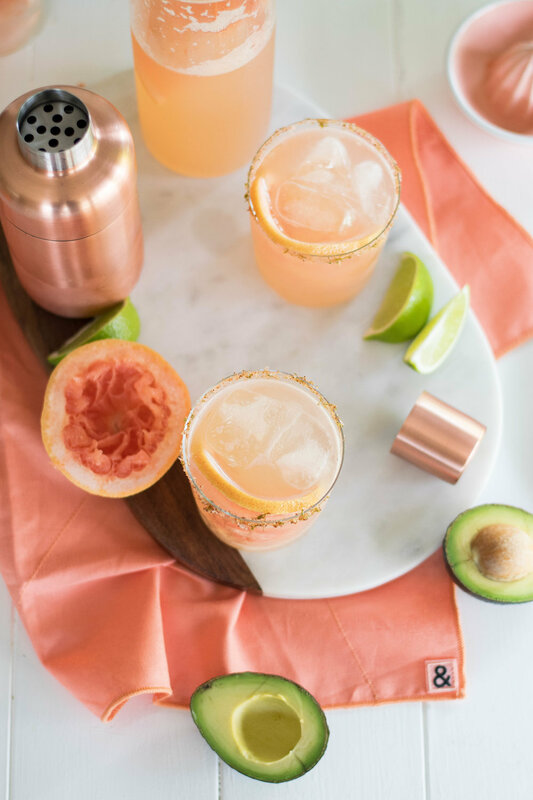 I love a tart and salty margarita as much as the next person, but sometimes I like to change it up, ya know? There's another really cool Mexican cocktail that doesn't get nearly as much attention as the margarita but is equally refreshing and delicious. Enter the paloma. It's still tart and salty but with the added fruitiness and slight bitter edge of grapefruit. Palomas are typically made with tequila but I went with mezcal instead. It adds such a delicious low-key smoky flavor. Mezcal, if you're unfamiliar, is similar to tequila in that they're both made from agave but mezcal has a distinct smoky flavor which is imparted from the wood-fired pit method of roasting the agave plant after harvest. I rolled the glasses in a little chili powder and lime zest along with the salt and it is so good with the smoky, fruity, tart flavors happening in the cocktail! I highly recommend you give this one a try if you're needing a change from the same ole margarita, too. Happy Cinco de Mayo! In a small saucepan over medium heat, combine the sugar and water and heat until sugar is dissolved. Allow to cool before using in cocktail. Store in fridge for up to two weeks. Combine the salt, lime zest, and chili powder in a shallow dish. Wipe the rim of a glass with a lime wedge then roll in the salt mixture. In a cocktail shaker filled with ice, combine the mezcal, grapefruit juice, lime juice, and simple syrup and shake for about 10 seconds, until shaker is cold. Pour into salt-rimmed glass and top off with sparkling water and a few ice cubes. Add grapefruit wheel. *The salt recipe makes enough for about 6 drinks so if you're having a party, just scale up the cocktail recipe to your number of guests and you're good to go!